Idk about the used web engines, but we can basically "load" mp4 videos, PDFs files... or other filetypes that AIR can't handle? On OSX the resizing works pretty well... Is not 100% accurate with the coordinates I pass while I resize the window, seems like it has a tiny delay to apply them, but I'm sure that's an OS thing, not ur ANE code. I realized, as I did this, that a "snapshot" bitmap, would be super handy! Just a suggestion, u already did a great job @tuarua. UPDATE: Damn, just realized it doesn't work on fullscreen 🙁 (kinda a deal breaker to me) I guess AIR don't use the NSView. The delay will be the OS. Doesn't work as in webView disappears or AIR blows up? It might be Stage3D context get's removed and readded and so it now ends up above the webView. As a quick test can you go fullscreen first and then init the webView? Perhaps I misunderstand, Do you mean the webView doesn't work in fullscreen or setPositionAndSize() doesn't work in fullscreen ? 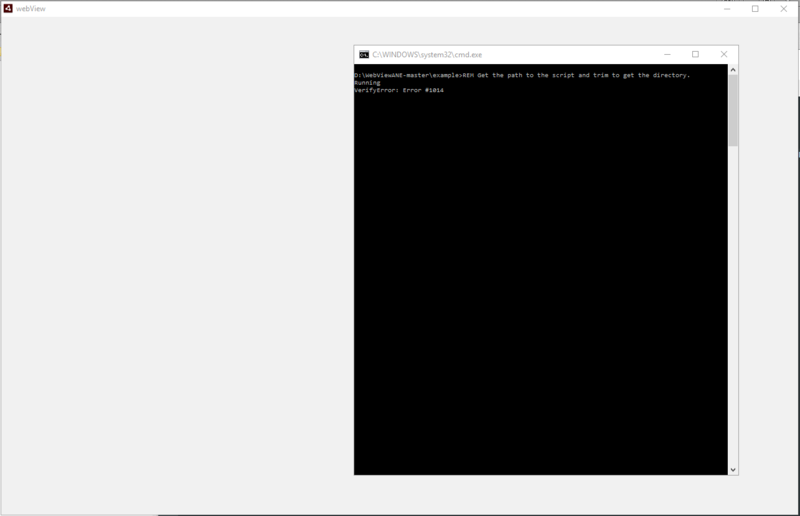 WebView doesn't render in fullscreen.... even if I call init() while in fullscreen mode. If i leave the fullscreen it renders normally. This happens on OSX, did not try it on Windows yet. The OSX fullscreen issue should be fixed. You'll need to notify the webview when Fullscreen state changes eg. Btw, I'm dealing with fullscreen and webview resize separately. So, when the Webview is invisible/closed [::removeFromStage()], and it receives the fullscreen event [webView::onFullScreen( fullscreen )], it's been re-attached to the screen 🙁 , not a big deal though, as I keep track of when is "open"/"close", so I'm using a condition for that, or I can remove the fullscreen event... just to let u know. Do u know if it works on Windows the same way? [ErrorLogger] ERROR = 15-01-17 19:51:52.25 :: [UNCAUGHT] ArgumentError ArgumentError: Error #3500: The extension context does not have a method with the name setPositionAndSize. Ah, I may have missed a dll for the Win version. i'm willing to throw some cash at this if it means we will FINALLY have a windows/osx webview solution for AIR..
holy moly that would be amazing. WebView app crash when i test in windown 7. please help me what i did wrong? Can you create an issue on the github repo. Better to resolve there. It's probably a missing dll. Also, CefSharp uses .NET 4.5.2 and perhaps I need to supply another dll or 2. I wasn't able to test on Win7. I donated $50 to the cause. Unfortunately, "webView.init" is crashing my debug build on Windows 10. I copied the cef_binaries folder into my AIR SDK bin, as well as the CefSharpLib.dll file. Many thanks for the donation. Much appreciated. Did you copy the contents of the unzipped cef_binaries folder ? Which IDE are you using ? The AIRSDK bin folder should look similar to this when the files are copied in. Looks ok. I am using IntelliJ + Win10 too. can you edit "example/rundebug.bat" to point to your AIRSDK folder. Then cd into the example directory and run from the command line. That may give a better crash log. Also, I'm trying to figure out which other dll dependencies users might need. Does this file exist on your computer ? 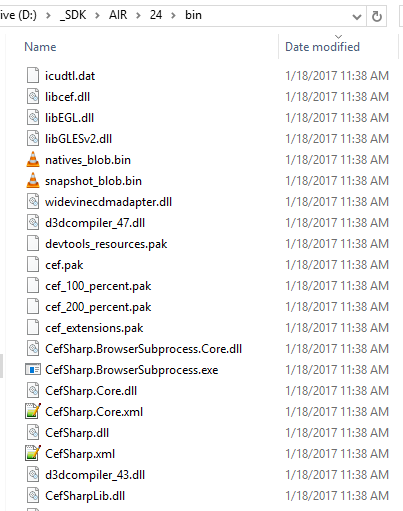 The "v3.0" folder does contain a "PresentationCore.dll" file, though. When I execute "rundebug.bat" I get a "folder doesn't exist" error pertaining to the "%pathtome%/../native_extension/ane/debug/" folder. I removed the "debug" portion of the path and was hit with an "application descriptor not found" error. I'm going to keep poking at it. I feel like I might be doing something wrong. Apologies, I didn't upload the debug version. Added that now. Is late here but will help more tomorrow. Ok, getting closer now. Using your latest Github package, I am able to build the example project. After the build is complete, though, I am hit with "VerifyError: Error #1014"
Building through IntelliJ gives me no such error. After the build is complete it just hangs and crashes like it was doing for me earlier. I'll take another look at it in the morning.